Jeanine Tesori’s diverse range of work continues to impress me. Whether it be the scores for the hugely successful Shrek or Thoroughly Modern Millie, the excruciatingly raw Fun Home, or the hilarious yet heart-breaking Caroline, or Change. 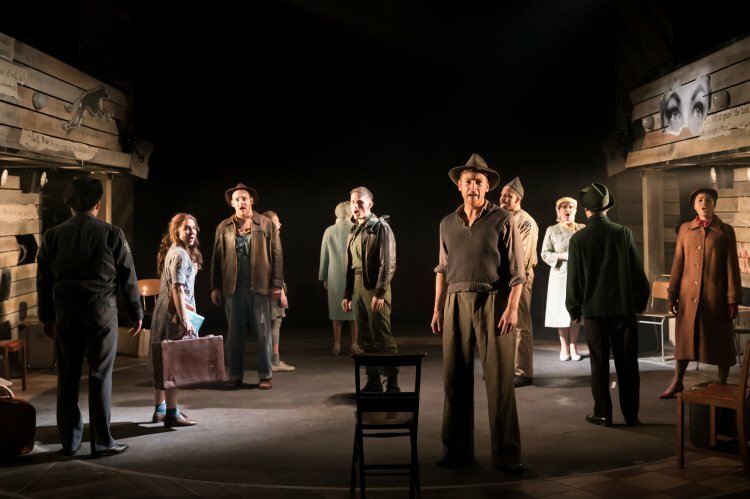 I was recently lucky enough to see fantastic productions of the latter two in this impressive list, and the latest of her musicals to brace the British shores is Violet, making its London premier in the beautiful transformed Charing Cross Theatre. Having visited Charing Cross over the last few years, I was pretty surprised to see that its traditional proscenium arch has been replaced with a new revolving stage in the middle of the auditorium, now with a traverse setup. Morgan Large has done such a wonderful job with the design, with brown and orange colours creating a warm rustic feel and the limited props appropriate for a musical where the characters are more important than the story. The revolving stage, while not exactly a new technique, is so appropriately used in this production to both demonstrate the journey the lead character is on (literally and metaphorically) and also for flashes back in time. The musical itself follows its titular character on a long bus ride from her backwards town in North Carolina to Tulsa, Oklahoma where she hopes a facial disfigurement she received in a childhood accident, can be healed by a famous television preacher. On route, she befriends two soldiers amongst other passengers and we begin to get an idea of the difficulty she has felt because of her scar. The horror of the scar itself is left to the audience’s imagination (rightly so) but it is quite evident through her own and other character’s reactions how serious an injury it was. Kaisa Hammarlund is just magnificent as Violet. Her introverted yet defensive characterisation is all encompassing both physically and in her speech. There is also so much character development in her performance throughout the musical as she comes out of her shell as the journey progresses. Jay Marsh and Matthew Harvey create likable supporting characters as two soldiers returning to their barracks. They are very distinct characters to each other; Marsh’s Flick is proud but with a calm nature, while Harvey’s Monty is more youthful and energetic. The dynamic between the three protagonists is an interesting one. Because of her scar, Violet feels she has an understanding of the prejudice Flick has experienced as a black man in early 60s America. Monty’s naive ignorance of the difficulty that either of his counterparts has gone through is evidence of the wider societal issue that just because you are not explicitly a contributor to prejudice, doing nothing can sometimes be just as bad. While Brian Crawley’s book hints at these wider issues throughout, it never feels like it is hammering the point home, but rather allowing it to linger beneath the central drama. Director Shuntaro Fujita’s production flows nicely and all the characters feel real and relatable. He has an eye for detail with so many subtle gestures or movements making a significant impact on the feel of this piece. He also handles the numerous flash backs eloquently, with young and old Violet often interweaving and even acknowledging each other’s existence in a sort of dream like state. As was probably clear from my opening paragraph, I am a huge fan of Jeanine Tesori’s work and her score for Violet is no different. Some of the harmonies are just beautiful (credit should also go to MD Dan Jackson and his incredible cast here), but what is most impressive to me is how Tesori seems to be able to write to any style. How this show differs to her other work is a discussion for another time but we have evidence of her extensive range even within Violet. You would be forgiven for assuming the selection of songs set in Memphis, or the gospel songs during the preacher’s television show, were written by completely different people to the rest of the score. This is a great production of a lovely show and one where everything falls nicely into place. A fantastic leading performance is backed up by a talented ensemble cast who are all a joy to watch. Is this BB's Best Season Yet?